Hamilton Academical and Falkirk go into Saturday's final Scottish Championship fixtures both hoping to take advantage of any slip-up by leaders Dundee. Dundee know victory over Dumbarton will secure the title and promotion while Alex Neil's Accies take on Morton and Gary Holt's Bairns host Alloa Athletic. "We've just got to take care of our own business," said Neil. And Holt added: "The target was to win the league. We're in there with a chance." A two-point gap separates Dundee and Hamilton, with Falkirk a point further behind. 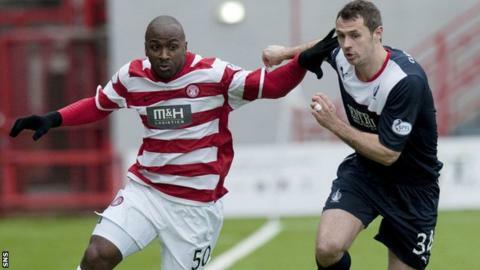 Last week, Paul Hartley's side took advantage of Accies losing to Dumbarton by beating Alloa while Falkirk missed the chance to go second by drawing with relegated Morton. And, having lost four goals to the Sons, Neil knows the threat Ian Murray's side pose to Dundee. "Dumbarton are dangerous, I think they're top goal scorers in the league," he told BBC Radio Scotland's Sportsound programme. "If anybody's capable of going up to Dundee and scoring some goals it would be Dumbarton. "We can't really focus on what Dundee and Dumbarton have got to do, we've just got to try and win our game. "And obviously if Dundee happen to lose the game then it gives us an opportunity to win the league, provided we get the job done. "The motivation for the players as well is to make sure, even if Dundee do win and take the league, that we finish second so that we don't go into the third v fourth play-off. "I think our fans will let us know pretty soon whether Dundee are winning or losing. If they're losing, we'll be well aware because the fans will be cheering as if we've scored a goal." Queen of the South will finish fourth regardless of Saturday's results and will play the team finishing third over two legs. The winner of that tie will take on the league's runners-up in the next play-off with the semi-final winner progressing to face the second bottom side in the Premiership. "The disappointing thing would be to come in at 17:00 BST on Saturday afternoon not having done ourselves justice and find out that the other two teams didn't get results and that we had shot ourselves in the foot," Holt said. "We know it's going to be tough. Alloa are fighting at the other end of the table to stay in the league and stay out the [relegation] play-off position. "Anyone can beat anyone, it is that tough. We haven't beaten Alloa this year, we haven't scored a goal against them." Meanwhile, Falkirk have offered new contracts to goalkeeper and captain Michael McGovern, defenders Kieran Duffie and David McCracken, midfielders Blair Alston, Luke Leahy, Conor McGrandles and Craig Sibbald and forward Rory Loy. And Holt added: "I'm pleased to say David McCracken has signed on again for next season with another year option, Luke Leahy similarly and Blair Alston has agreed to sign as well. "I've got to say a big thank you to the board because they're the ones that have agreed it. They've been phenomenal for me and hopefully the fans can see what we're trying to do. "We've been assessing the squad over the season and the last few months. Myself and the board have looked at rewarding out of contract players and players under contract as well."